This year we’ve decided to skip the long drives north and have relocated (at least for few days) to HI-Lake Louise Alpine Centre in Lake Louise. Since we didn’t want to waste a day just for relocation, we decided to pack everything the night before, drive directly to Lake Louise Falls, climb it and then check in to our new place of stay. It was yet another super cold morning, at -20C at 9am and no sign of warming up. I got to say that cold weather can take a lot out of a man. 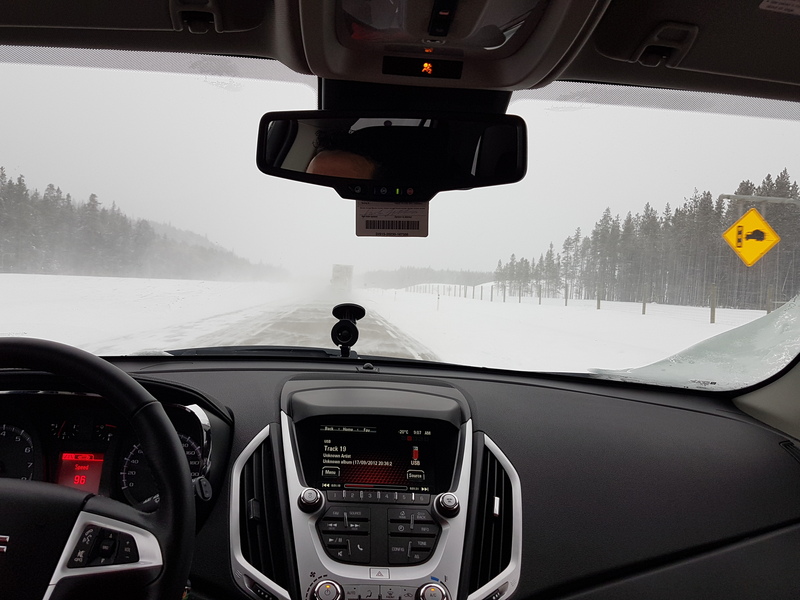 Anyway – the drive from Canmore to LL is around an hour, but in those bad conditions it took as a bit longer. The climb itself is a local mega-classic, and can be done in many different configurations. The crux would be the pitch out of the cave, touching on WI5. Other than that it is between WI3 and 4 on lower pitches, depending on chosen line. 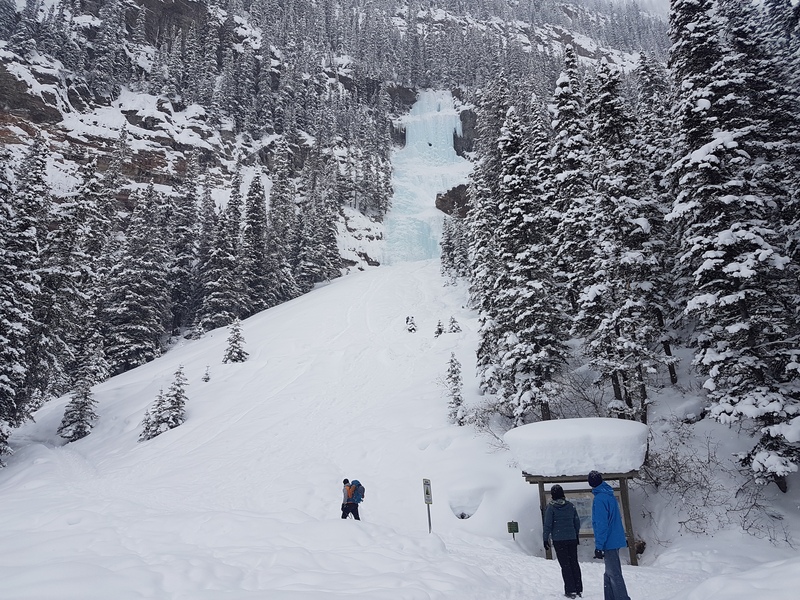 Looking up at Lake Louise Falls. 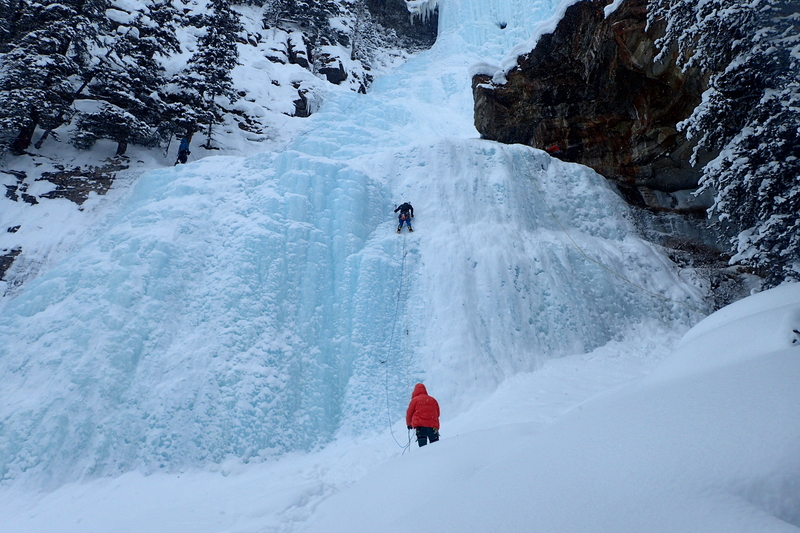 When we arrived to the bottom of the slope, Lar and I decided to start walking up to the base of the ice, rack up and just start climbing. When we got there, there was already one team on the easiest, most left line, and another pair getting ready to start on 2nd easiest – most right route. I decided to lead the first pitch and go middle right. A solid WI3+ (in my opinion) pitch. 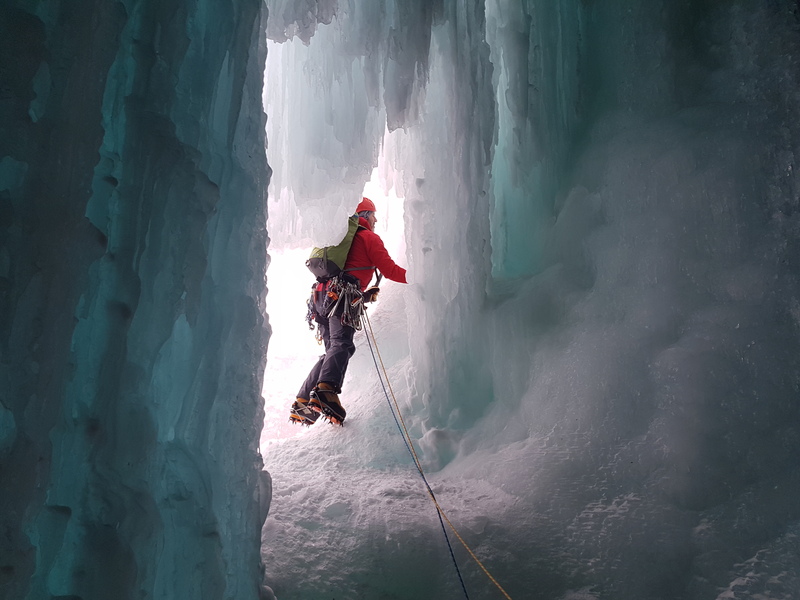 I have finished it with ice screw belay just left of the rock feature, leaving what would be pitch 2 leading to the steep ice under the cave to Lar. To be honest this is where the game began, and PG stepped in taking us to the cave on a short, but tricky lead, that required some interesting technique. The cave via its main hole is a must do for us at this point (you can also enter from the side, but is not as exciting). 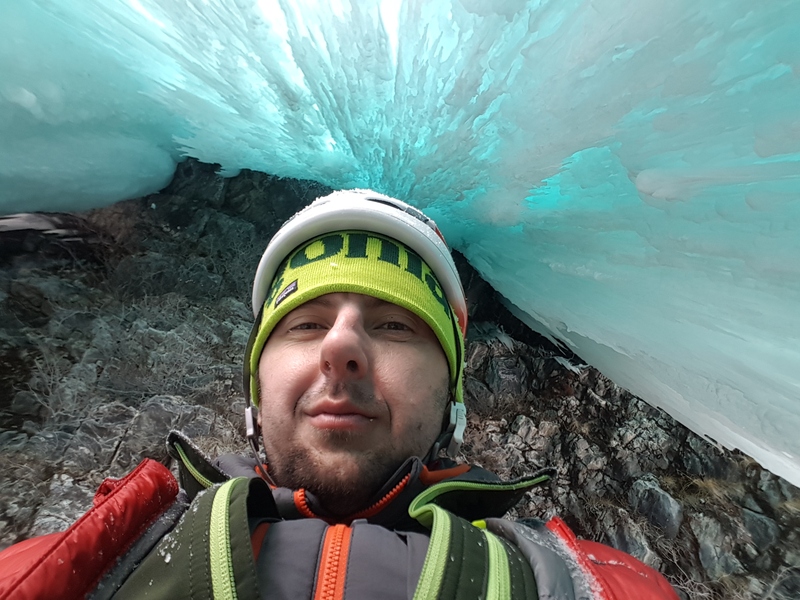 From the cave there are 2 options – you either run it out in one 50m pitch to the tree belay at the top, or break it down in 30+20 (where the 30 takes u to the ledge above the cave, as we’ve done it last year). PG didn’t take any prisoners on this one, and run it out to the top on mere 4 screws. This year the cave is so fat that it is very difficult to get a good photo of anything from the inside, but the exposure is just unreal. Fair play to PG for that lead. This definitely was touching WI5 shape. I left the cave 2nd and clipped the bolts above the tree belay few minutes later. Lar finished the climb with a serious case of hot aches, of which I have hilarious video, which I’ll release at later date. Taking the middle or right line makes it quite straight forward to get down, as instead of abseiling you can walk off on the gully to climbers right. It was a good day out, even though it was super cold all day. By the time we got to the car it was still -14C. But as usual, it was worth it. Quick drive from the climb car park took us to the hostel, where we promptly checked in. We still are undecided how long we want to stay in Lake Louise (initially booked in for 3 nights). I guess it will all clear up in coming day or 2. ← Day off. So let’s talk about The Professor Falls!